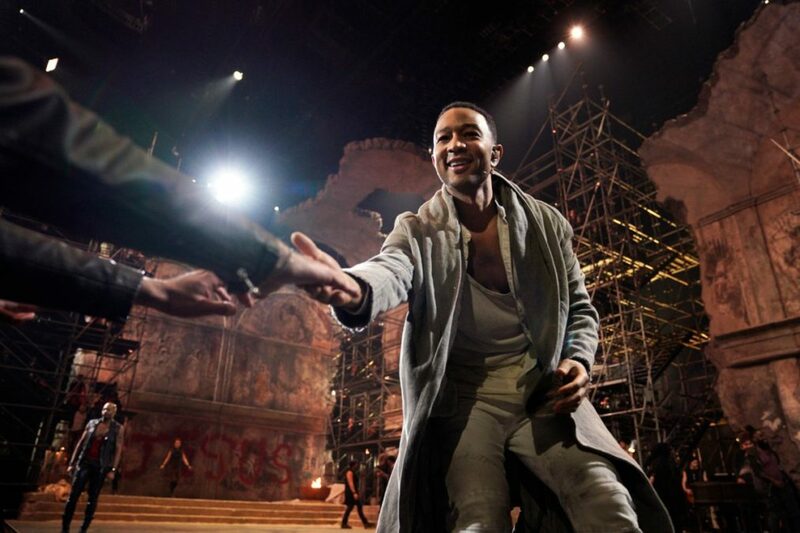 What Was It Like to Watch Jesus Christ Superstar Live! Live? Last night, NBC resurrected the classic musical Jesus Christ Superstar just in time for Easter. Following up the network's past live musical broadcasts such as The Wiz, The Sound of Music and Hairspray!, this Andrew Lloyd Webber tuner follows Jesus and his apostles in the days before his crucifixion. Audiences saw the stunning performances from John Legend, Sara Bareilles and Brandon Victor Dixon, but they didn't see what happened on the set when the cameras were switched off. Broadway.com did, though, and we're letting you in on some moments you might not have caught at home. So, what was it like to watch Jesus Christ Superstar Live in Concert, live? And most of us didn't know where we were going. 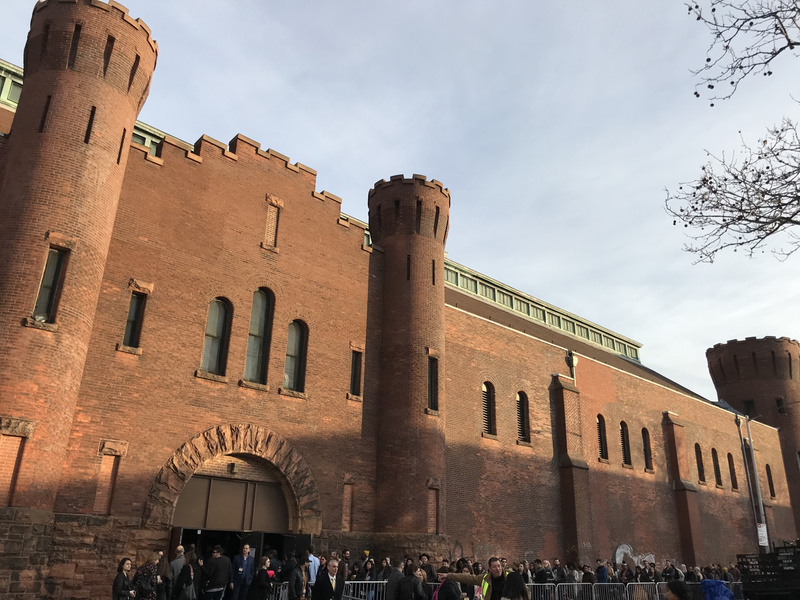 We were transported à la high school field trip through Brooklyn from the 1 Hotel to the Marcy Armory in Williamsburg, a huge, 19th Century 165,000-square-foot brick fortress that's become a popular set for filmmakers. 2) It felt like a football game. 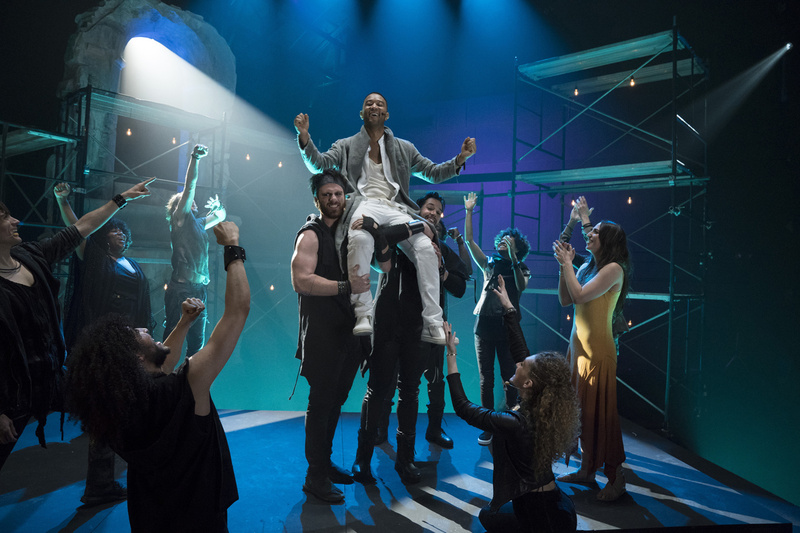 Within the first moments of the opener, Brandon Victor Dixon (as Judas) got the audience clapping, waving and stomping so much that you could feel the bleacher seats swaying. After the curtain call, members of the first few rows thought they were at the Super Bowl and stormed the stage to dance with the ensemble members and Alice Cooper. 3) Glitter cleanup is a hard job. In addition to sand that ensemble members scattered across the stage, glitter from the "The Temple" scene as well as (spoiler alert?) Judas' suicide, seemed to reproduce over time. It took two commercial breaks, a team of eight guys frantically sweeping and eventually a vacuum, just to clean it up. 4) The ensemble were the unofficial hype team. Cast members would run up to the mosh pit off stage and wave their arms up to get the audience going. Plus, during commercials, family and friends would shout to the performers they knew and cast members blew kisses to them. 5) Marc Platt wants you to dance! Before the show started, the super-producer encouraged the audience to—if the spirit so moved them—shout, dance, sing along and flail their arms in the air. In "Hosanna," the front row and mosh pit earned their spotlight with some arm waving. 6) There was a not-so-strict dress code. 7) People went nuts over John Legend's "Gethsemane." 8) We couldn't hear some parts, either. Before going live after commercial, members of the audience would start cheering before the actors even did anything. It's a rock concert, after all. This sometimes meant the beginnings of songs were garbled, which seems to have translated on air as well. 9) The set was huge. You probably noticed that at home, but we want to reiterate it here. Around 25 ensemble members had to run up and down the long set just to hit their cues. It makes sense, because Andrew Lloyd Webber never wanted this rock opera in a traditional proscenium theater, which is why he objected to the original 1971 Broadway production. This production wasn't filmed on a sound stage, like Hairspray! and Sound of Music were. Instead, multiple cameras in the audience, on stage and overhead captured the action on the singular stage. Last night's exciting broadcast has us pumped up for the next scheduled musical, Fox's Rent, which is scheduled to air on January 27, 2019. Hell, they can reuse the scaffolding!